Brainquilty Music Festival is returning for its second year this February 16th - 17th! 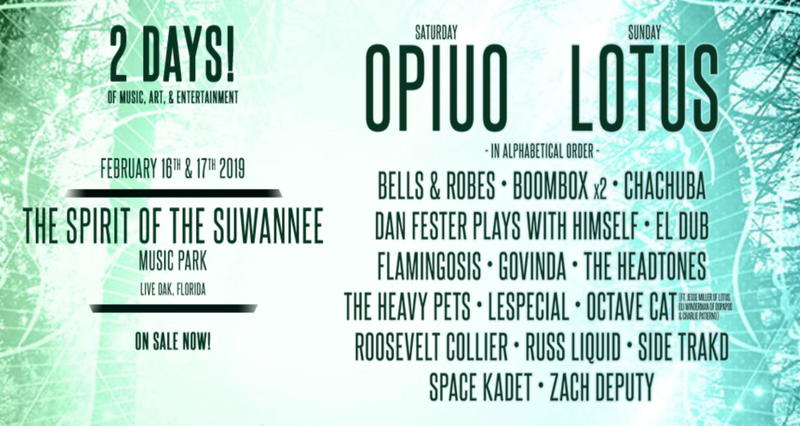 For its second go, Brainquility 2019 will be held the famed festival venue, The Spirit of the Suwannee Music Park in Live Oak, Florida. For those of you who haven't attended an event there all we have to say is--GO! Another new plus to be noted is Brainquilty has now evolved into a two-day experience. Camping, live music, art installations and other activities will be doubled...what a concept! The Brainquility 2019 lineup boasts a diverse collection of talent, incorporating jazz, electronic, funk, jam, and more. Artists featured in the Brainquility lineup include Lotus, OPIUO, Russ Liquid, Zach Deputy, Flamingosis, Chachuba, Dan Fester, The Heavy Pets, The HeadTones, Lespecial, Roosevelt Collier, Space Kadet, as well as, some local acts that will be sure to impress. Between several live music performances, immersive art, and unique surprise activities, Brainquilty promises an intimate, yet exciting weekend for attendees! Brainquility tickets can be found by clicking the link below.